Mac Miller was recently chosen as one of MTV Jams’ 2011 Fab 5, which also includes Big Sean, Future, Meek Mill and Big K.R.I.T. During his interview, the Pittsburgh, Pennsylvania kid explained that his grandfather gave him the name “Mac” when he was little and said the moniker just stuck. “My grandpa started calling me Mac when I was born, so it stuck. It’s cool; my grandpa was a huge Mack Maine fan,” joked Mac, who previously went by Easy Mac. 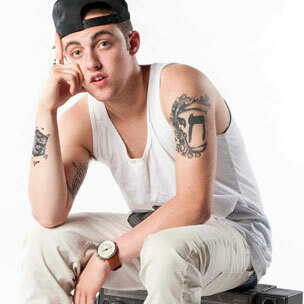 He also spoke on who Mac Miller is as an artist, stating that he’s just a normal guy trying to live out his dreams. “He’s a 19-year old rap phenomenon from Pittsburgh who enjoys life and enjoys making music every day and working very hard for everything he gets,” he said. Mac’s Rostrum Records debut, Blue Slide Park, is due later this year.